An exciting selection of our best caviars. An ideal way to enjoy our caviars - try a selection of caviars and see which ones you prefer. This is the best way to really appreciate the differences between the caviars. 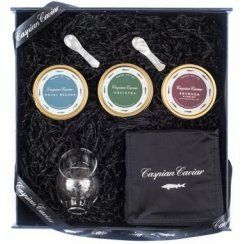 Will you taste the caviars on your own, with a loved one or with some friends? Our trilogies also make great gifts.